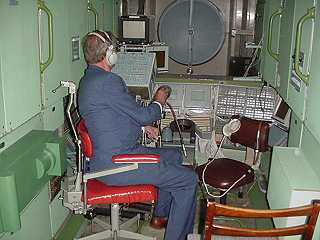 The TORU system, a backup teleoperated rendezvous control system, became known to the public when it was used during the catastrophic manual approach of Progress M-34 to Mir on June 25, 1997. 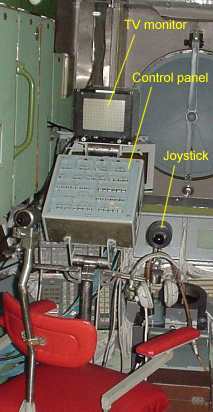 In connection with the launch of Zarya, ISS's first element, the antennas for TORU were identified. It has been quite obvious when looking at pictures of the TORU antennas on Zarya that the frequencies used for the TORU links are in the VHF band. The use of 121/130 MHz for the TORU links is an obvious possibility because the main VHF voice downlink is at 143.625 MHz. Maik Hermenau in Dresden has picked up unusual signals on 121.75 MHz during the final approach of Progress M1-2 to Mir on 27 April 2000 at 2115-2122 UT. At this time Mir and Progress were well within the coverage zone from Dresden (see map on the right). The docking took place at approximately 2130 UT. I have tried to receive TORU signals during dockings between Progress and Mir, but never succeeded. However, these dockings occur too far to the east to be visible from Stockholm where I live. The spacecraft are just below my radio horizon. Therefore I was quite excited when Maik Hermenau (check out his web site "SatellitenWelt") contacted me with a sample of a signal received on 121.75 MHz during a Progress approach to Mir. If confirmed by other observations, one can probably conclude that Maik really picked up the TORU signal from Progress. My guess is that the TORU system was switched on to initiate a backout in the event of a Kurs failure, i.e. the Mir crew could take over in case the automatic docking system malfunctioned. The picture on the left shows the spectrum of an extract lasting a little more than one second of the signal received by Maik Hermenau . A subcarrier at 2603 Hz can be seen as well as 50 msec tone burst at a rate of 6 Hz. 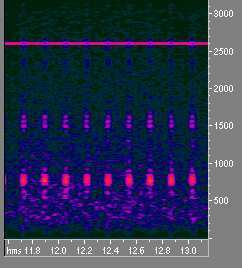 In the spectrogram on the right the tone bursts around 800 Hz can be seen as a wide peak and the multiple tones in the 1450-1650 Hz range can also been seen as well as the main subcarrier. Listen here (mp3) for a recording of the signal. The spectrogram below was recorded by myself from Progress M1-6 on 121.75 MHz at 0012 UT on 23 May 2001 as the Progress approached the ISS (which was transmitting TORU signals on 130.167 MHz). In this spectrogram one can see 50 msec tone pulses between the main synchronizing pulses. These tones take on discrete values in the range 1450-1650 Hz. 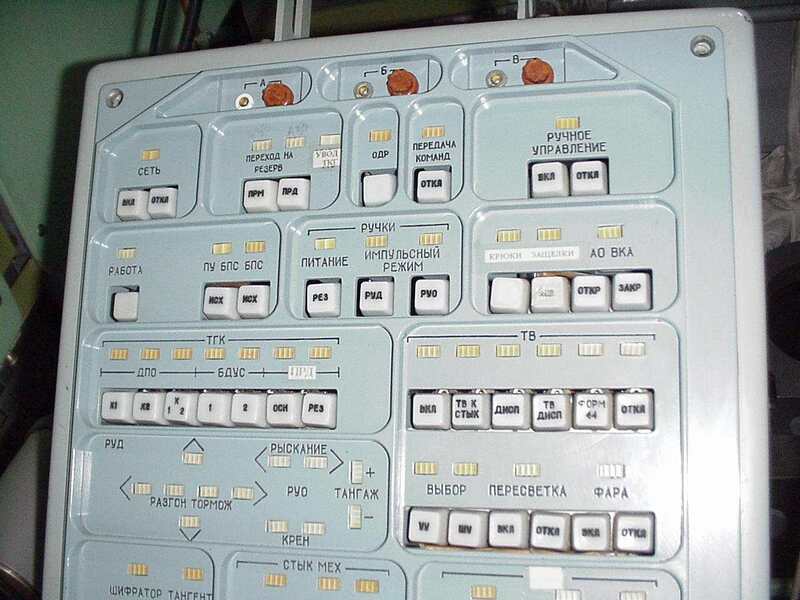 These pictures were taken by Chris van den Berg at the Cosmonaut training Center (TsPK) and show the TORU training workstation (left), Chris at the controls (right), and the TORU control panel (below). 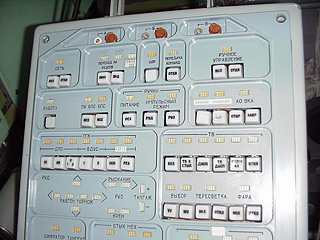 By clicking on the control panel picture below you can access a high resolution picture of this device. Thanks, Chris, for providing these unique pictures.